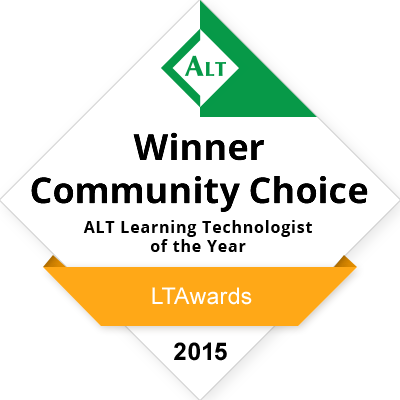 The first assessment we fully implemented with PebblePad was Portfolio Analysis. An assessment which is completed each year at PSMD. Before this assessment was set up in PebblePad, it was completed and marked the traditional, non-technical way using pen and paper. Whilst this was ok. The move to an ePortfolio solution such as PebblePad was an important one for this particular assessment as it allowed for richer content in the portfolio’s, access anywhere content, cloud storage for everyone, re-usability, time-saving, cheaper to manage and take up less physical space (compared with storing thousands of pieces of paper each year) to name a few. This academic year we began with two assessments: Portfolio Analysis and Clinical Logs. Portfolio Analysis (PA) has been rolled out to cohorts for years 1-4. Each year has two PA summative assessments with year 1 having an addition formative assessment at the start of the year. Clinical Logs has been rolled out to cohorts for years 1-2 (all formative right now). 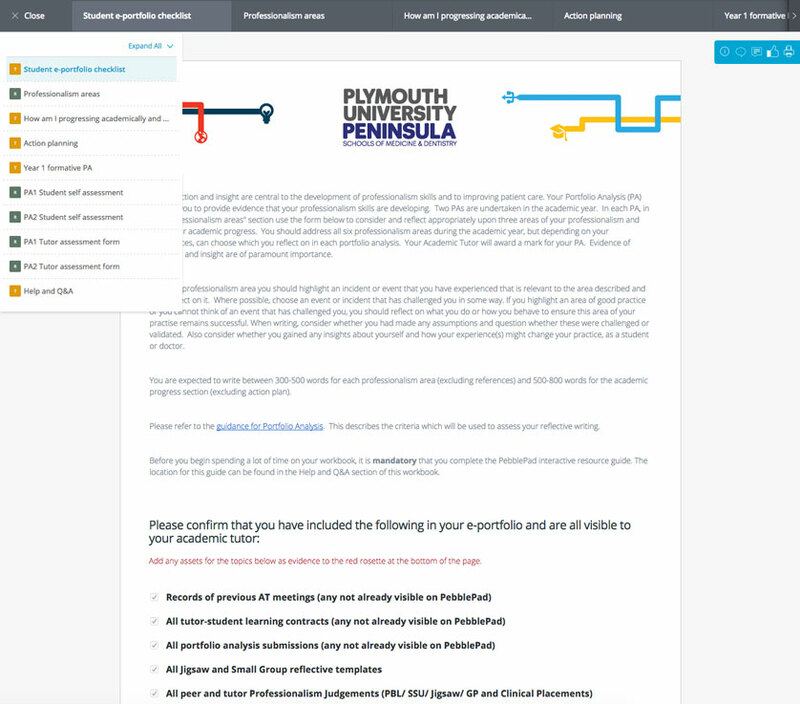 Putting these assessments into PebblePad was a fairly straightforward process. Especially with the latest version of Pebble+ (v5). We were able to create workbook templates that had a nice aesthetic look and feel to them, and we were able to separate the contents of the forms into pages which chunked the assessments into manageable sections. 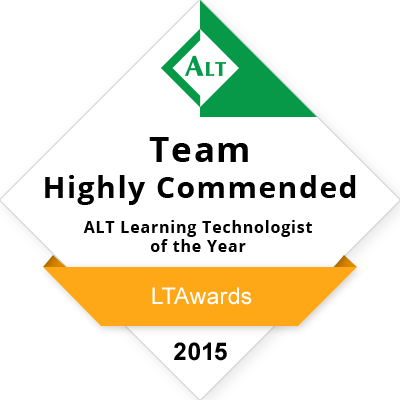 Tie all this with PebblePad’s ATLAS system and the two assessments were good to go! We’re now two years into using PebblePad for the Portfolio Analysis assessment and whilst it has been a bit of an uphill struggle, we are definitely noticing improvements in the adoption of the way the students are embracing the use of technology to their benefit. Unfortunately the same cannot quite be said for the academic tutors. We’ve captured a lot of feedback from the academic tutors and whilst most do just get on with it fine. There are many that find the system unintuitive and difficult to use (particularly those who admit to not being tech-savvy and would rather avoid using these types of systems). We have also received feedback from tutors who say working on paper takes up less of their time. Each year we re-vamp the previous years help guides in the form of PDF documents and YouTube videos. 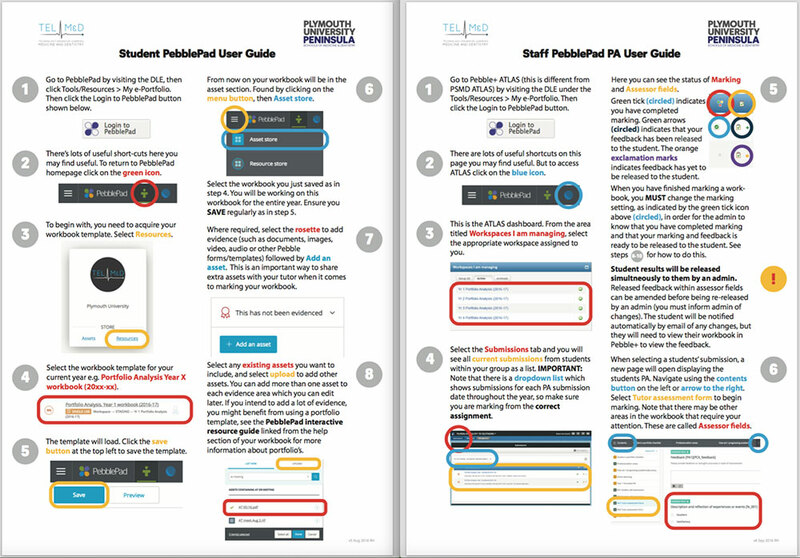 Both describing the processes involved with accessing, viewing, marking and more that are essential steps to marking the assessments in PebblePad. However, despite all this, the main downfall to PebblePad is the ease of use, and understanding of ATLAS. Having said that, we know ATLAS is improving and will soon contain more features that will benefit us in terms of how we would like to use ATLAS. From our point of view, it has been an extremely demanding task to support students and staff. And for staff, this includes academic tutors as well as admin staff. Both of which use the systems differently. What else are we using PebblePad for? This year, we implemented a benchmarking system in PebblePad. It was a slightly more complex process to setup. As benchmarking is so the tutors can learn and assess themselves against a globally agreed score, to help them all generate consistent marks and feedback. We created three pre-populated workbooks (pre-populated as if completed by a student), for years 1-3. Tutors were then given access via ATLAS, where they could take a copy and mark any of the three workbooks for extra practice (workbooks for years 1-3 are largely similar). They then complete marking and adding feedback before verifying a page in the workbook. This unlocks the marks and feedback as agreed by the benchmarking team. The tutors can then use this to compare with what they wrote. The process on the whole, works well. However, again, the main criticism is how unintuitive the process is. Despite providing instructions in form of a PDF guide, YouTube video and contextual support and information within the workbooks themselves. A lot was learned from this and feedback has been gathered. We already understand what needs to change and improve where possible for next year. This combined with a few promised updates to ATLAS from PebblePad should make the process a lot smoother for everyone! A lot was learned from this and a lot of very useful feedback has been gathered. We already understand what needs to change and improve where possible for next year. This combined with a few promised updates to ATLAS from PebblePad, should make the process a lot smoother for everyone! This year, we created and started to use PebblePad for PDRs. It holds goals for the year as agreed with a manager as well as objectives and deadlines. 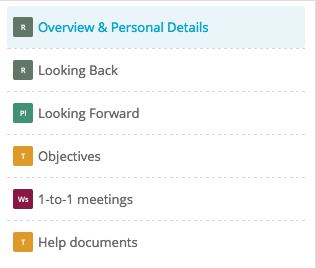 We also have template links to 1-to-1 meetings which make it super easy to create at the start of a meeting then attach to the workbook at the end. Then at the end of year, it’s easy to review all of the books content from the meeting notes and compare with the original objectives. We also use tags in our assets to manage any extra evidence against objectives and notes. So far it’s working well! When creating a portfolio to apply for CMALT, I used a PebblePad template that was shared with me by a colleague that helped me get started and structure the portfolio as expected by ALT. Being able to tag assets and organise them helped me organise the portfolio in a way that meant I could easily find and re-use later for anything similar I may apply for in future.